Although The Lord of the Rings is almost always referred to as a trilogy, that was not Tolkien’s intent. Tolkien meant for The Lord of the Rings to be a novel composed of a single volume divided into six books. The publisher’s decision to divide the The Lord of the Rings into three volumes, each comprising two of Tolkien’s books was dictated by the economics and shortages in post war Britain and once established, Tolkien’s work has remained a trilogy even when there is no particular why it shouldn’t be published as a single volume. The trilogy concept works well enough for The Fellowship of the Ring and the The Return of the King. Books one and two are in strict chronological order and there is only slight overlap in books five and six. The Two Towers chronicle the adventures of the scattered members of the fellowship with book four focusing on Frodo and Sam while book three deals with the other hobbits and their companions. Placing two books covering the same period of time with no interaction between the main characters of the two sections gives the impression that The Two Towers is really two novels somewhat arbitrarily placed in one volume. This impression is mistaken, however. Books three and four actually complement one another. Book three begins small with just the hobbits Merry and Pippin led captive by orcs across the plain of Rohan with Aragorn, Legolas, and Gimli following in a seemingly vain hope of catching up and rescuing them. Both the hobbits and their would be rescuers encounter other peoples and forces, the Ents and the Rohirrim, and get drawn into the larger world as part of the war against the traitor Saruman. In book four, the plots remains focused on Frodo and Sam. They take Gollum as their guide, they meet Faramir son of the Steward Denethor, and they see the Morgul army as it marches out to destroy Gondor, but throughout it is simply Frodo and Sam. The first part keeping growing into the wider world while the second part narrows to two hobbits. 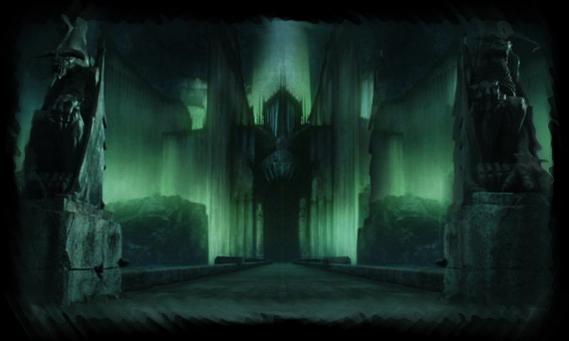 The Two Towers shares the themes found throughout the Lord of the Rings. Once again it is the small and the humble who get things moving. The two hobbits rouse Treebeard and the Ents into marching against Saruman. The seemingly insignificant Gandalf in a tattered gray cloak is revealed as the mighty Gandalf the White. And of course, Frodo and Sam accomplish the nearly impossible by traveling into Mordor. The sense of loss found in the Fellowship of the Ring is even greater in the Two Towers. In this book, Men and Orcs are the actors. Except for Legolas and Gimli there is not an Elf or Dwarf to be seen. Their time is passing and Middle Earth will become a world of Men, whichever side wins. King Theoden is amazed to learn that Ents still exist but laments that much that is unknown to him will be ended by the war. Faramir admires the Elves but does not seek them out. Men and Elves have become estranged and each walks further down their separate path. His own people, the Dunedain, have declined over the centuries and are now hardly better than other Men. The Ents have lost the Entwives so no new Entings can be born. The old world is passing into a newer, and lesser world. Sir Christopher Lee Dies At Age 93 (popdust.com) A great loss. This entry was posted on June 28, 2015 at 4:13 pm and is filed under Books I've Read, Deep Thoughts, Heroism. You can follow any responses to this entry through the RSS 2.0 feed. You can leave a response, or trackback from your own site.